I’ve recently dived deep into WCF and security. To be exact I’ve tinkered with something that is called 2-Way–SSL a little. It’s a quite complex topic and I will try to summarize what I’ve learned. b) issuing one for yourself. While choosing the way to go, keep in mind what do you need it for. The whole point of certificates is they need to be trusted. For your development its sufficient you trust yourself, but if you want to sing the SSL communication from your website or sign the emails you send you will need something more. 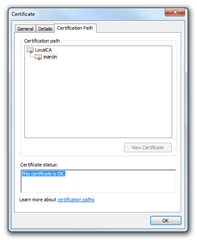 For some purposes a free certificate from issuer like COMODO, CAcert or StartSSL are sufficient. They will only verify that you own the domain and/or email. If you need more thorough verification you will have to pay (from tenths to thousands of dollars). Add a password for your private key (or choose to use none). This command will create a certificate *.cer and a file containing the private key *.pvk. 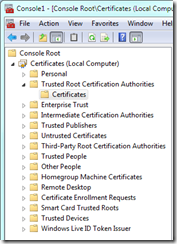 The certificate needs to be added to “Trusted Root Certification Authorities” store. To do so, start the Microsoft Management Console (execute mmc.exe) and from in menu go to File –> Add/Remove Snap-in… and choose Certificates. 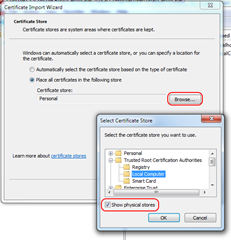 Press Add > button and choose to manage the certificates in Computer account and on Local computer. Then press Ok.
Find the *.cer file you created using MakeCert and add it to the certification store. The fist one will create a private key file and a certificate under your certificate authority MkCA issuer for “localhost” computer. The second one will create *.pfx file that contains both the certificate and the private key (and it can be protected by a symmetric key – a password – to assign one use the –po switch to pvk2pfx). The *.pfx file is necessary to secure the communication. The server will send the certificate (containing among other information’s a server public key) to the client. 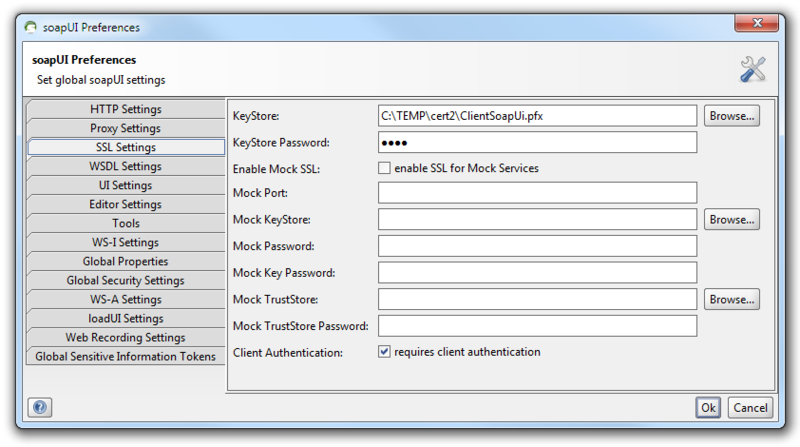 The client will encrypt a random number using the server public key and send it back to the server. This number will become a symmetric key used by both parties to encrypt the communication. 4. Pick the *.pfx file you’ve created and enter password (if you used one). 5. Choose binding type https and newly imported SSL certificate. Voila the website supports now secure communication. As you can see there is a problem with the certificate. 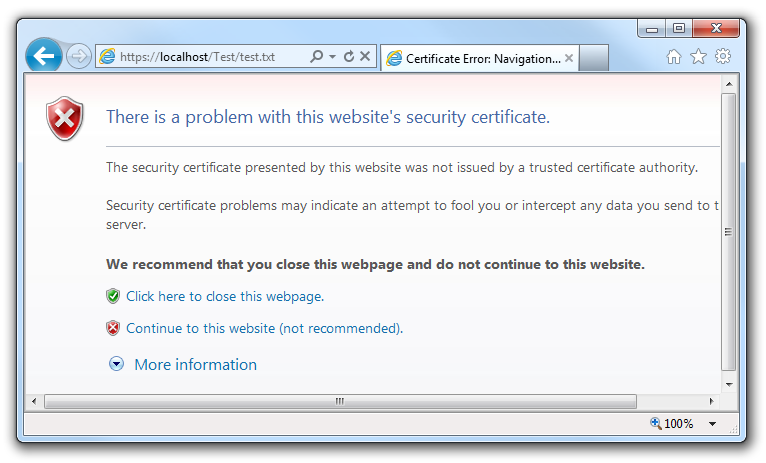 It’s because the browser tried to verify the issuer of the server certificate and failed. It failed because the issuer is not trusted. 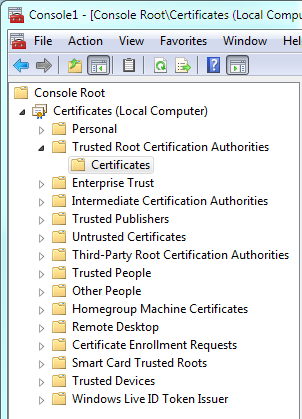 As you can remember you’ve added your certificate authority key to the computer storage. But it’s not enough the browser uses the Current User certificate store. So you will have to add the certificate authority once again to user storage. Use the mmc.exe again. 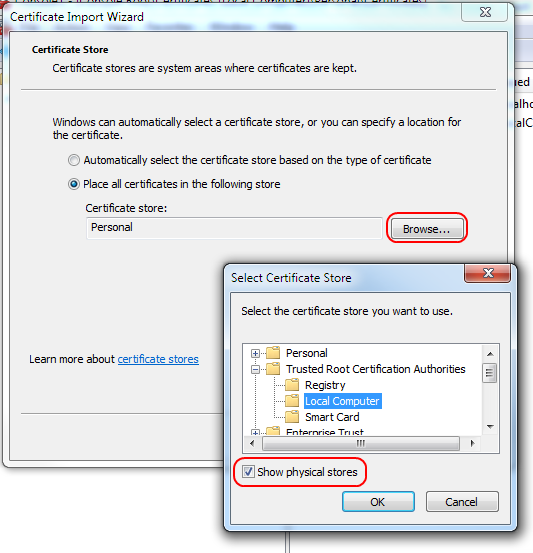 Add Certificates snap-in but choose “My user account” this time. Then add the CA certificate as described in section 1. Note: if the certificate keeps disappearing (why? I don’t know – id did on my machine) from the store please experiment with the storage. Choose Registry or Local Storage as showed below. Restart the browser and the problem report will be gone. The communication is encrypted. The certificate is trusted. The term “2-Way-SSL” is sometimes used to describe the scenario where both the server and the client need to verify each other. It means that not only the server must present the certificate. The client need to do accordingly. 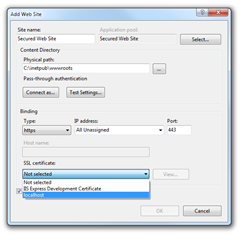 On IIS it can be achieved by setting the client certificate requirement in the “SSL Settings” of the web site or web application. 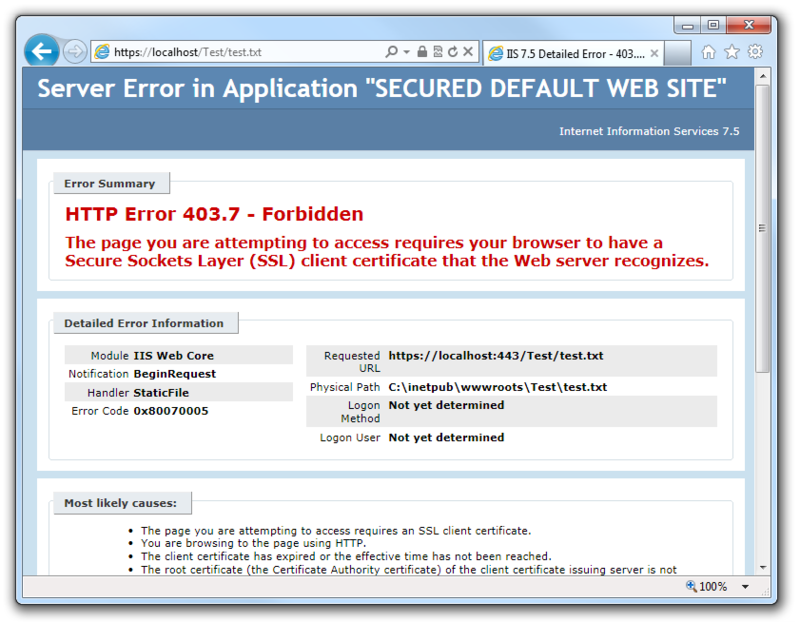 Set the Require SSL and choose to require client certificates. 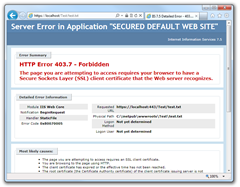 From now on you will get the HTTP Error 403.7 – Forbidden if you will try to get the resource in the browser. It’s because you don’t have the client certificate ready on the client side. Lets fix it. We will need a *.pfx file one again. Lets create one. 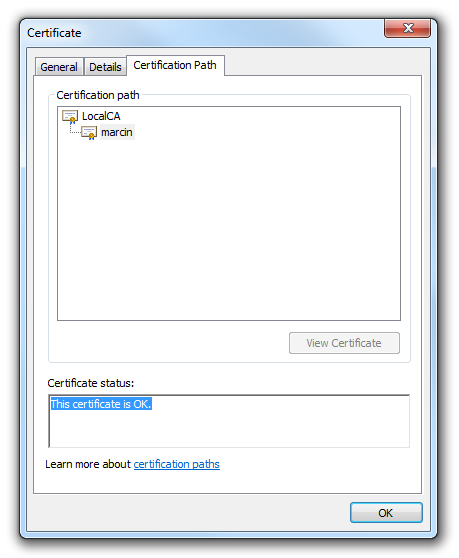 With the *.pfx file ready you should add it to Personal –> Certificates in the Local Computer. 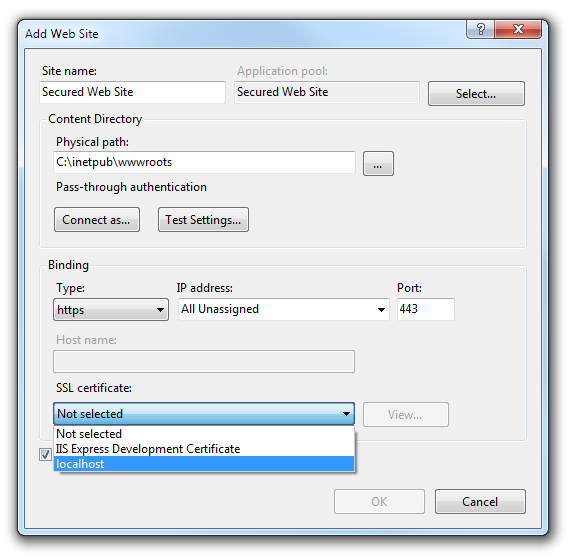 Now the client will be able to present the client certificate and accomplish the 2-Way-SSL. It’s now time to glue the pieces together. 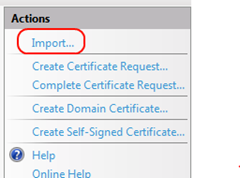 Lets configure WCF service to use the client certificates to communicate with the server. 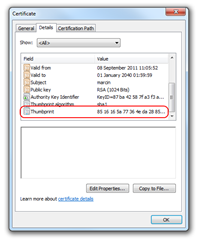 It tells the client to use the client credentials taken from a CurrenUser certificate store and to search for the certificate using a given thumbprint (findValue). 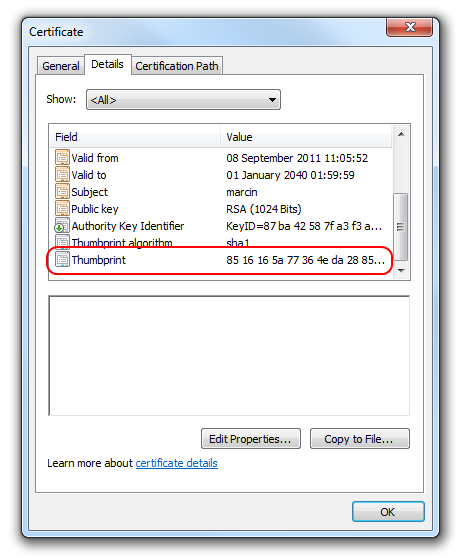 You can find the thumbprint in the certificate details tab. The rest of the client configuration is easy. 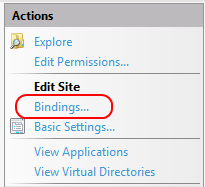 wsHttpBinding like the one you used on the server plus gathering everything together in client configuration block. 3. If you are testing the SSL configuration using another browser then IE keep in mind that it can use its own certificate store and not the default windows one (Firefox does, Chrome not). I had to create a *.pfx file WITH password to make it work. Then if the server is configured to transport level security you can simply send a XML request to it to check if everything works fine.